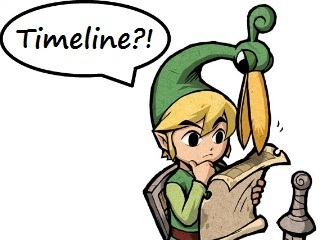 How Do You Think the Legend of Zelda Timeline Goes? Here’s a topic of discussion we haven’t opened for awhile, and given the confirmation of Skyward Sword as the first game in the timeline, before even Ocarina of Time it’s one that I think is long overdue. There are probably as many theories about how the series’ overarching storyline progresses as there are fans, but I want to focus mostly on the core questions: what order do you think the games fall in and how do you fill in the gaps in the story? Around the end of 2008, there was a movement within Zelda theorizing to start incorporating all kinds of information that was previously discarded. Among this information was the infamous “Miyamoto Order.” First mentioned in ‘98, this was a reported statement Miyamoto made in an interview about the timeline order as of Ocarina of Time. The statement defied expectations by putting The Legend of Zelda and its direct sequel, Adventure of Link, in-between Ocarina of Time and A Link to the Past – previously the conventional wisdom said that A Link to the Past was originally designed as a prequel and Ocarina as yet another prequel. Pretty much the entire theorizing community denied its veracity based on the idea that Miyamoto simply doesn’t know what he’s talking about since he doesn’t care about the series storyline or something like that. Ben Lamoreux put together a good defense of this order in his article, “Exploring the Miyamoto Timeline.” The theory draws heavily from the fact that the Triforce was split up in Ocarina of Time and argues that Adventure of Link is the bridge game that reunites it so that Ganon can make his wish in A Link to the Past. This order also inspired other articles such as my Sleeping Zelda and New Hyrule theories. This theory was popular for awhile in the 90s and around the release of The Wind Waker, but it didn’t really get much representation on ZI until Ben’s “Legends of Hyrule” article set the spotlight on it. It’s pretty basic: because the games rarely bear actual plot relationships to one another, it’s likely that they’re all just stories about Link, Hyrule, the Triforce, and Ganon that are based somewhat off of a core mythology. No need to speculate how all the games fit together; they’re all retellings of the same core hero tale. Working off of the dead-ends most theorists run into when trying to place A Link to the Past and the “legends” framework laid down by Ben, I came up with an idea of my own: the games are literally to be taken as “legends,” but there is still an overarching story that all of them belong to. So they connect, but because they’re “legends” they don’t have to connect in a perfect or exclusive way. This would explain some of the creative licenses taken for example in Ocarina of Time‘s treatment of the Imprisoning War, where the Triforce splits instead of falling in its entirety into Ganon’s hands. Also, as legends, it’s possible for there to be multiple stories that branch off of a single origin point – hence why Ocarina of Time is officially seen as the prequel to three games when the “split timeline” story device only accounts for two of them. I treated this theory in “A Legend and a Timeline”, and to this day it represents most of my current thinking on Zelda lore. The cynicism here is unforgivable, no? Dathen Boccabella talked about this possibility last year in his articles “The Nature of this ‘Timeline Document’”. He argues that even though Miyamoto and Aonuma have both mentioned a document that lines out the way all of the games connect, it’s probable that it wouldn’t exactly answer all the questions of the series in the way anyone expects it to. All right, so given Nintendo’s rather loose approach to chronology in most of the games this actually does sound pretty plausible, but outside of a few bad days when it seems like there’s no solid solution, is there any Zelda fan that really believes this? Where do the classic and Four Swords games go? Is Ocarina of Time the Imprisoning War? Is The Minish Cap before Ocarina of Time and/or Skyward Sword? Do all of the games fall on the traditional Adult and Child timelines, or are some part of their own alternative story arc? What mysteries do you hope Skyward Sword will answer? Give us your thoughts in the comments section – and please be as in-depth as you’d like!